If you have a military veteran in the family, this is a great way to honor them. They are also good as awards. 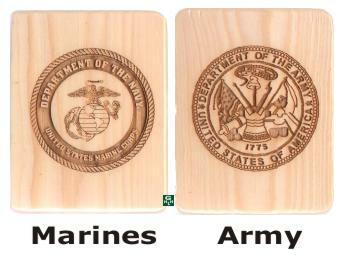 We have logos for Army, Navy Air Force, Marines, and Coast Guard. In fact, the sample below has a picture of our daughter when she graduated boot cap for the US Navy. She left the Navy as a Petty Officer. All our plaques are made of recycled white pine, edges eased, sanded smooth, and finished with at least 2 clear finish coats. Finished size is 3 1/4" X 4 1/4"
Image Logos are laser etched and all information is to your specifications. All plaques have solid brass hinges. This plaque below is an example of the one used for the finished lasered product. Fill out the form below to order plaque. The top part of the form is the purchaser information. Green sections are info to go on the plaque itself. Please fill out the form and submit before using the add to cart button as this will take you to the shopping cart.